Since we occasionally get posters on here who describe alarming situations with their dogs, for which they have not yet sought veterinary care, and because these posters often insist their dogs are "in NO pain," I thought it timely to have a thread that discusses the signs a dog in pain might display. Dogs do not need to be screaming in extreme agony to tell us they are hurting, and below are some signs to take note of. 1. Panting. If your animal is panting at unusual times other than in the heat or after exercise, especially if they are panting excessively, they may be in pain. 2. Drooling. Unless you are holding a juicy steak in front of your dog, abnormal drooling should be noted as a sign of possible pain (and dental or GI issues). 3. Trembling/Shivering. Animals will often tremble or shiver when they are hurting. It is important to suss out whether they are trembling from a behavioral situation (assuming no one leaves their dog out in the cold, here) or if they are displaying symptoms of pain. 4. Change in demeanor. Withdrawal, lethargy, depression, aggression, irritability. Pretty self-explanatory. If a dog's normal personality and attitude either abruptly, or over a period of time, changes--it's a red flag and needs to be investigated medically. Particularly with older animals, sudden signs of irritability, snapping, etc can signal achiness and pain. 5. Change in activity level, can be subtle. This is where close observation of your pet's daily habits is important. If your normally over-the-top Frisbee dog seems okay, but when you think about it, hasn't sought out any play, exercise or interaction with you, something may be wrong. I had a recent example of this, with my agility girl suddenly declining some of her jumps, which she normally takes with superincredible enthusiasm. It turned out she had a back injury--and there were only VERY subtle signs of what turned out to be a fairly serious injury that is quite painful. 6. Change in posture/range of motion. If your dog is standing or sitting in odd positions that are not normal for them, be on the alert, and investigate. If you notice a change in ability to use any limb, a decrease in range of motion, or a look of being stiff, have them evaluated. 7. Change in bathroom habits. Again, fairly self-explanatory, but a reluctance to get up and go out for elimination, or odd postures when eliminating, or a big increase or decrease in bathroom habits, and this needs checked out. Can be pain-related. 8. Limping or odd gait. This is one that even most novices recognize, but sometimes the lameness can be subtle, so watch them carefully when they are exercising or participating in dog sports. Also, an occasional "hitch in the get-along" is not to be ignored. What can start out as mild and infrequent signs of lameness/pain can escalate, untreated, into far more serious problems. And just because a dog doesn't cry out in pain with a limp, does not mean it doesn't really hurt them. 9. Decrease in enjoyment/enthusiasm. This one is kind of interrelated with the change in demeanor and change in activity level, but I wanted to stress it again, because some drivey dogs may be so focused on pleasing their handlers that they continue on, looking fine to the casual eye, but can increasingly show less and less enjoyment of the work/sport, due to undiagnosed pain. 10. Vocalizing. This is one most everyone "gets." Hey my dog is crying out when he tries to walk, he must be hurting. Actually, many dogs, and Dobermans in particular, are quite stoic when it comes to pain, and for them to have reached the point of vocalizing, the pain is likely VERY serious, at that point. 11. Unexplained weight loss/difficulty maintaining weight. A dog in pain will not "thrive" as usual. If parasites and illness have been ruled out, and nutrition is appropriate, consider undiagnosed pain as a culprit if you cannot keep weight on a dog that normally holds their weight fine. Change in appetite and weight are often the first signs of pain in an animal. 12. Change in pack dynamics. If you have a multi-dog household and suddenly your other dogs are no longer deferring to a dog they normally do, are being overly solicitous of that dog, or they are not interacting as they normally do with him/her, or even picking on him/her, that can be a sign of trouble, pain, or illness. 13. Glassy eyes/vacant look. Sometimes, you can literally "see" the pain in an animal's eyes. Pay close attention, esp. if there are other warning signs, to how "bright" your dog's eyes and expression are. If it looks "wrong," then it probably is. Animals in pain will often have a sort of inward-focused "far-away" and glassy look to their eyes. Don't ignore this, get them in to be checked. Disclaimer: I am neither a vet nor play one on the internet, and this is just based on my own experiences, reading, observation in working with dogs over the years--so I'm going to shoot Reddobes a PM and hope she has the time to review this--and TIA to her, as she so generously does share her time and knowledge on here. Any of our other great vets who want to chime in, that would be great, as well. Also welcome are thoughts and observations from others as I'm sure I missed and forgot a few things. Bottom line: If your dog is acting "off," please consider a medical issue, including possible pain, first and foremost, and get them appropriate evaluation and care. They deserve that from us, their guardians. Last edited by RedFawnRising; 07-14-2010 at 12:07 PM. Bravo. This needs to be a sticky. Excellent post - I agree, it should be a sticky. If a dog is crying or moaning in pain, especially one like a Dobe, Rott, Shepherd or Bully type, then the level of pain is probably way beyond what we humans would consider bad. 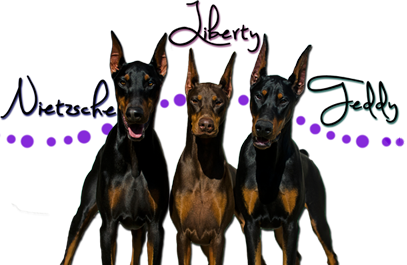 Titles: AKC CH, CGC, Utility, Obedience, Agility participates in Therapy. Great post and enjoy your dedication....all posters above! Excellent list - it should be a sticky. I thought of another to add - licking or paying attention to or quickly turning around to look at a body part. I think it's also important just to know your dog, and trust your instincts. Our Shepherd was a drama queen (behaviors and vocalizing), Frankie was ultra stoic (no signs of anything until it was really bad), Silas is also stoic but more likely to let us know something is off than Frankie, though not vocally. So with Henneh- a whine meant nothing other than keep an eye on her. With Frankie, she never got to a whine, so a slight decrease in activity or "waggy-ness" or missing a meal were HUGE. Of course it's easier when you've been with a dog longer. When they're older you have more background to base your worries on. I think it's also important just to know your dog, and trust your instincts. . I agree 100%. This is how I figured out my last Dobe was bloating. He was just slightly off. Within 15 minutes, I was throwing on my clothes and getting out the door, but if I hadn't really watched him, who knows what might have happened. And although DH carried him into the car, once we got to the ER vet, he peed on every bush and walked in normally. They looked at me like I was a crazy person when I said I think he's bloating. Once they got him back and did an exam, it was obvious. Oh, yipes, I can't believe I forgot the licking and paying extra attention/looking at a body part. That is how my first red rescue boy presented with an issue with a hind leg--turned out to be osteosarcoma. He had a diagnosis of lick granuloma, but it turned out to be far more serious, obviously. And yes, trusting your instincts. Probably the most important thing of all, trust your gut, and act on it. And as Adara said, even if other people or the vet staff themselves look at ya at first like you're crazy, push for that exam and make sure. Excellent post. I agree that this should be a sticky. A lot of new dog owners (or even experienced ones) don't notice the subtle signs until it's sometimes way, way too late. Thanks for taking the time to type this up! This is an excellent post. And I agree, knowing your animal is half the battle. The horse I had previously, Apollo, was prone to colic. If I ever saw him standing in the pasture and raise/stamp a front hoof, more than one time in a row, I immediately went to check on him. For some, that would be a minor thing and they wouldn't even notice, but I knew that with him, when he did that, better check on him b/c he's in pain and 99% of the time it was colic. Excellent post. I agree it should be a sticky. Since Dobes are so stoic, new people to the breed should be aware of the subtle signs of pain. EXCELLENT thread (now sticky) RFR! I have no idea what prompted you to take the time to create this FABULOUSLY INFORMATIVE thread , but THANK YOU for taking the time to educate. I am thinking of a way right now that I can "inspire" you to create a list such as this in regards to what makes a rescue REPUTABLE, for those who wish to adopt a rescue dog (we've been talking about doing that for FOREVER). THANKS AGAIN for taking the time that it took to create this wonderful list. Thanks again, RFR, for taking the time and effort to help. When Bella was having her difficulties with car travel, along with the trembling and drooling, she was also dribbling from her nose. Excellent post. Pacing is also one that could be added. Thank you, Karen, for compiling this essential info/thread! As always, above and beyond the call of duty - you rock! and thanks, Burns - for making it a sticky! 1. Decreased appetite - this is especially true of cats (and often the only sign), but dogs as well. Surprisingly many dogs with oral pain (abscessed teeth, etc) will still eat just fine -- most dogs don't chew their food all that much normally or they just chew on the other side. 2. Repetitive bowing/stretching. All dogs stretch normally, but it's not uncommon for dogs with GI pain (pancreatitis, GI foreign body, obstruction, etc) to hold a bowed (like they would for a play bow) position or stretch the rear legs (walking forward w/ front legs while rear feet stay in place) repetitively. For example, when my old girl had her GDV her only sign was that she kept backing up (and her spleen was large upon palpation). She was only torsed 1/4 turn so her stomach did not expand like a typical bloat/GDV situation. Had I not known her behavior was NOT normal, the outcome could've been far different. She had xrays & ultrasound that night and surgery the next am. Another example - when my cat was so kind as to feed his favorite toy to Isabel and it got stuck in her intestine, she kept bowing and stretching and was really just not herself. Even though her xray was inconclusive, I went to surgery on a Saturday night based solely on her behavior. Good thing, too, as I had to remove 2 sections of intestine. Had I taken the "wait-n-see" approach, she likely would've died. 3. Reluctance to move, walking hunched/stiffly - these are often signs of back or abdominal pain. Sometimes it can be quite difficult to differentiate between the 2. Reluctance to raise the head or look up is often a sign of neck pain - dogs with neck pain often keep their head much more level with their body instead of carrying it up (think Western pleasure horse). 4. inability to rest/get comfortable. The dogs will lay down only to get back up a minute later and reposition and often repeat this several times. 5. Re: panting -- also wanted to add that panting (when it's not hot or after exercise) can also be one of the first signs of heart issues. And the dogs may not be truly panting (open mouth, tongue hanging out), but sometimes just an increased respiratory rate that is not appropriate for temperature or exercise level. Panting can also be associated with stress and/or fear -- commonly seen in dogs with noise phobias. Bottom line as others have said -- if something seems off, much better to go see the vet and find out it's nothing, than to "wait and see" and have catastrophic results. Thank you so much for looking over the information and adding to it! Great info! should be stickied! Oh wow, what a great list. Even though I read dogs pretty well and know what a dog in distress looks like, these facts are written down in black and white, and if you guys are anything like me, I like to double check my facts when one of my dogs is just - not right. My dog and horse library is obscene. Thanks again Karen, and everyone else, I just added this thread as a favorite page on my Google homepage. Ok, as usual I am late to the party but this is an excellent post. This is a great post. I just wanted to add one more thing which is what made my decision to go to the ER vet for Flirt's obstruction. She's eaten random things in the past and we've always been able to watch her at home and she's thrown them up. I do call my regular vet to walk me through and check gums, etc. The big indicator for me she was sick was that she laid down in "odd" places. Places I've NEVER seen her relax before. A corner behind a couch and then another corner behind our coffee table. I raced to change out of my pjs and off to the ER vet we went. Basically KNOW YOUR DOG. It can save your dog's life. 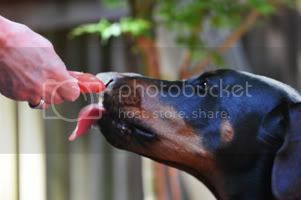 That's how I knew my previous Dobe was bloating and that Flirt was in major trouble this time. If you aren't sure, just GO to the vet. Good one to add! Frankie did this too on her last day with us.